"Roscoe Jenkins aims for the heartstrings and funny bones, a raucous helping of family soul food." 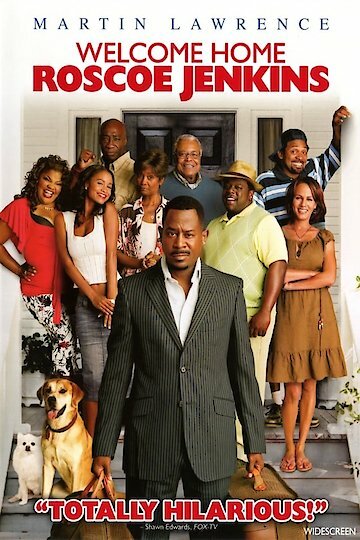 Welcome Home Roscoe Jenkins is a comedy that has family values and shows some of the confrontations a family can go through whether they are famous or not. Roscoe Jenkins is a very successful talk show host that has everything a man can possibly want. He has a gorgeous fiance, a son, a nice home, and money. Seems as though the problem he faces in the story is centered around his family. Roscoe is invited to his parents 50th anniversary family reunion and as a child, he grew up having to deal with being made fun of for not standing out or being successful at anything. After getting settled at the reunion, the family has an obstacle course set up in which Roscoe has always been competitive with his brother who tends to easily get under his skin. Roscoe wins and happily rubs the accomplishment in everyone's face yet upsets his son and family because he did not help his son during the game he was too focused on beating his brother. After a family arguement, he decides to leave early and his wife throughout the movie already was fed up with his family and when they make their way to the airport, she even insisted that Roscoe does not invite them to their wedding. Roscoe goes along with the act of agreeing and his son becomes completely upset but soon finds that Roscoe ends the engagement, drops her off, and takes himself and his son back to the family home. When they show up, they are having closing remarks and Roscoe finds that his competitive brother misses him and is sorry for making childhood not so great for Roscoe. Roscoe speaks and amends are made during the ceremony and he eventually gets the girl he once had a huge crush on as a kid as a presentaion plays for the family. Roscoe then decides that he will change the name of his show to the family's name to pay tribute and respect for the love he has for them. Welcome Home Roscoe Jenkins is currently available to watch and stream, buy on demand at Amazon, Vudu, FandangoNow, iTunes, YouTube VOD online.